When mountain bikes first began to become popular it was quite common to hear both non-cyclists and people who had been riding road bikes for years asking why. After all, except for the most expensive models, mountain bikes are often quite heavy and clunky, and besides, (with a few exceptions), most cities are not known for containing mountains! However, mountain bikes turn out to be ideal for many commuters. Although heavy, they are also robust and sturdy, and therefore stand up well to city riding. 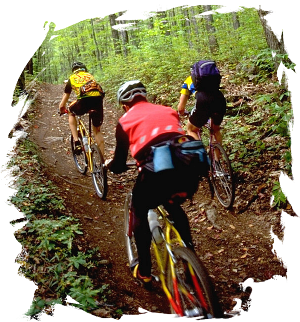 Additionally, many people find mountain bikes easier to ride than road bikes, because mountain bikes have gears and brakes that can be accessed without taking your hands off the grips. Of course, there are things about mountain bikes which aren't ideal for urban use. Big chunky tyres designed for muddy tracks are not the best for city streets, a gear range designed for steep mountain slopes may not ideal for urban areas, and although city cycling can be tough on a bike, it's not nearly as tough as riding on a mountain - and hence frames can be overly strong (and hence heavy). If you feel strongly about these things, perhaps you ought to consider a hybrid bike, which has many of advantages of a mountain bike, but is more adapted to the urban environment. On the other hand of course there are advantages to mountain bikes, and their extra strength is a positive boon if you find yourself carrying a lot of weight on your bike. Furthermore, after you have started riding a mountain during your regular commute to work, you may eventually be tempted to try the off-road experience at weekends.